Starting and growing business with cold roll forming machine? - ZhangYun Machinery Manufacturing Co.,Ltd. You are here: Home » News » Product News » Starting and growing business with cold roll forming machine? Starting and growing business with cold roll forming machine? Roll forming simply refers to a type of rolling involving the continuous rolling or bending of a long strip of metal sheet (typically coiled sheet) into a designed cross-section of choice. The strip moves through series of rolls mounted on consecutive stands, with each series performing only an incremental part of the bend until the cross-section that is desired is obtained. cold roll forming line is usually used for producing constant cross-sections with long lengths and in numerous quantities. There are different types of roll forming machines that are available and are characteristic for the type of shape, thickness and sizes to be produced. One of such is the cold roll forming machine which involves a metal plastic forming process and is still mainly used in industrial production of roll metal sheets. As a starter of roll forming line business and if you desire to grow your business, the cold roll forming machine is simply the best option available, one of the reasons being that cold roll forming is an energy saving and material saving metal cold forming process. It is a widely used process in construction, automobile, railway, aerospace and in other related fields. 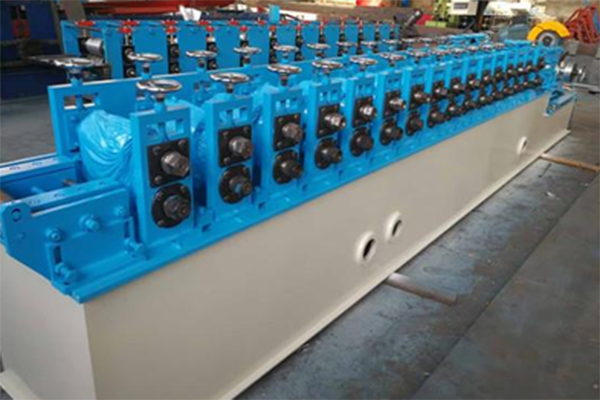 Basically, the most common cold roll forming machine usually is multifunctional. This multifunctional cold roll forming machine is used to open and level the certain width steel, the steel enters into the forming machine and with the aid of the roller, the steel is cold roll formed to the shape of choice. This multifunctional cold roll forming machine has different rollers, which can be used in the manufacture of numerous kinds of the cold roll forming product such as piling, U-steel, hat sectional steel, vehicle frid, C-type steel, etc. As earlier mentioned, the cold roll forming machine saves energy thereby helps to avoid unnecessary expenses on energy, more so, it helps void wastage of materials that could generate to extra expenses in waste treatment and or disposal. Additionally, as this machine is capable of producing different metal shapes and sizes through its different rollers, it helps the business owner to save cost that may be required in buying different machines with different rollers in order to keep up with the ever growing and changing customer requirements. More so, the cold roll forming machine ensures the production of high quality strip or metal sheets possessing very tight tolerance demands at high productivity levels, a basic property to ensure meeting customer standards and rendering satisfaction. There are certain features of the cold roll forming machine that makes it even more desirable for starting up this business. First and foremost, the machine comes with a relatively cheap price when compared to other kinds of roll forming machines. Secondly, it has a considerably low maintenance rate and this may be attributed to its less complex design that enables easy cleaning and servicing process. More so, this machine has been designed to withstand corrosion and hence stands a very low chance of getting rust or becoming corrosive. Of ultimate significance is its sturdy construction that ensures its long term durability, thereby avails the owner in avoiding unnecessary repairs and maintenance, and as such minimizes the cost of production.